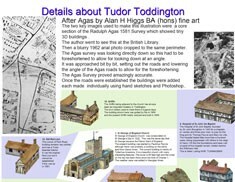 Ralph Agas, the Elizabethan surveyor, was commissioned by Henry Cheney to survey his estate at Toddington in 1581. The resulting map measured 11 ft 4 in. x 8 ft 6 in. and is one of the finest extant early field system maps, showing buildings and other features in meticulous detail. It is now held by the British Library (Add MS 38065). 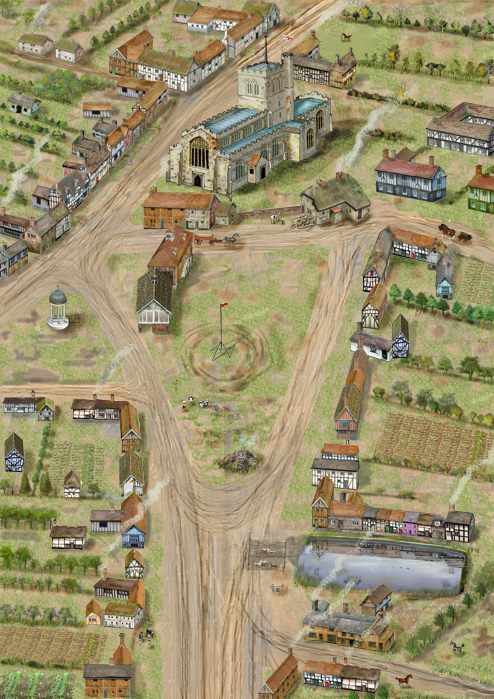 Two present-day Toddington residents, John Little and Alan Higgs, have spent many years studying it and teamed up in March 2015 to present an open weekend (opens in new window) to display a copy of the map and a modern reconstruction of sixteenth century Toddington and the manor house. The manor house, where Elizabeth I and James I were entertained, was later described by the Toddington historian Blundell as Cheney’s Palace. John Little is the third generation to run Poplars Garden Centre at Toddington (opens in new window). He was fascinated by the map because it showed so much of the topography of the area that he knows, including the location of the garden centre. 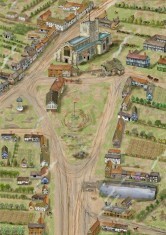 During the open weekend session, he pointed out many features of the map such as the names of occupiers and the acreage of strips, the marshy area by the river Flitt, the care with which so many features were depicted and especially the delightful cameos of sheep, horses, haywains, to say nothing of the naked individuals around the legend at the top left of the map. An enlarged reproduction of the map is on the wall of the Learning Zone in the garden centre. It is available to see by appointment (opens in new window). 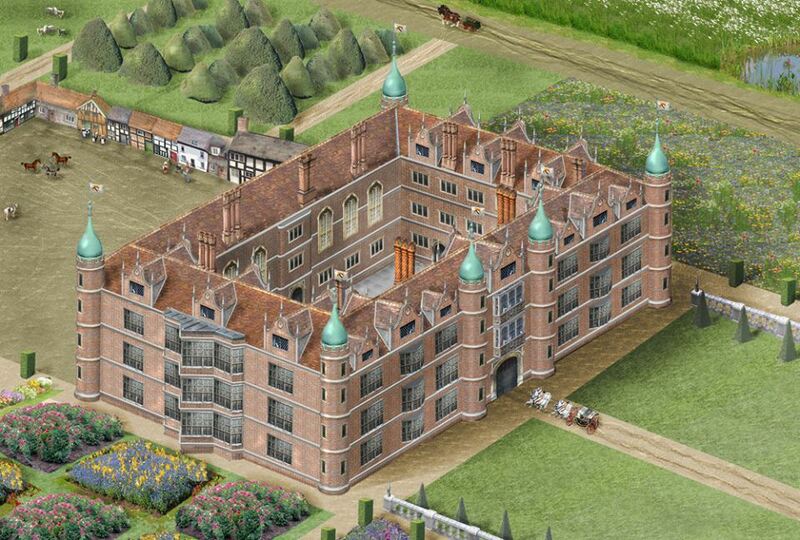 Based on careful study of the sources, Alan Higgs has used his building skills and fine arts training to illustrate a reconstruction of sixteenth century Toddington and Cheney’s Palace (open in new windows). 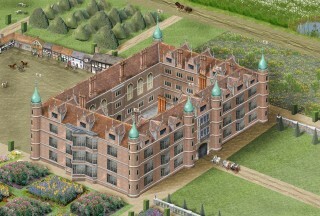 The sources he drew upon are the Agas map; John Thorpe’s drawing of Cheney’s Palace, now in the Soane Museum (opens in new window), which shows the location, layout, dimensions and architectural features of the palace; and the ‘survey of the several defects and other reparations wanting to be done at the Manor House’, prepared by a bricklayer and a carpenter in 1719 and printed in BHRS vol. 74. In addition ‘The inventory of Toddington manor house, 1644’ (BHRS vol. 11) shows how the house was furnished and used in better days.